Après Furniture supplies fixed or freestanding display bookcases and units in a wide variety of designs and styles to suit your requirements. We offer modern bookcase solutions including wooden bookcases, tall narrow bookcases, bookcases with doors, as well as supplying contemporary shelving units UK-wide and globally. What’s more, display shelving doesn’t have to be linear. 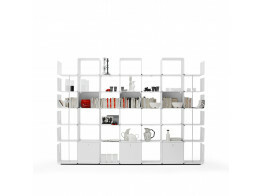 A white bookcase like the Cloud Bookcase from Cappellini (other colours are available) is a modular shelving system which has circular apertures on which to place books or other objects, presenting them all in an impressive bookcase solution for the contemporary office or home environment. We can also provide totally bespoke display bookcases, handcrafted using only the finest wood veneers. Custom made bookcases can be designed to your exact specification and sizing, with an ideal footprint for your existing floor space and requirements. Some of our display bookcases offer a whole lot more than storage. The BuzziBassTrap, for example, is a stackable acoustic shelving system designed to absorb low frequency sound at the office. By placing this modern bookshelf solution in the corner of the office low noise level reduction is maximised. Alternatively, by stacking and positioning BuzziBassTrap in the centre of your noisy office total reverberation time for high frequency noise is reduced. Other options include cube shelving units with box storage, using display bookcases as room dividers, and accessories like slide out drawers as well as the option of height adjustable legs for uneven floors. Remember, if you cannot find the right display bookcase for your requirements please give us a call on 020 7221 7914 and we can create a tailor made bookcase just for you. 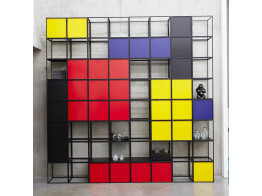 Scala Shelving System is a modular minimalist display and storage unit. 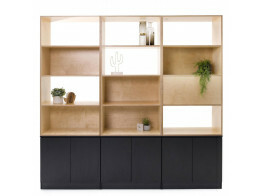 Palisades Wood is a modern style display shelving unit for dividing spaces. Cage is a simple, stylish shelving system built to last. Designed to be modular for you to easily build, adapt and reshape. 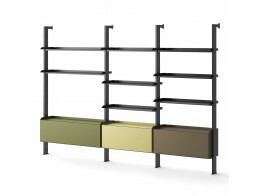 cWave modular bookcase's flexuous design and sense of lightness is due to its sinuous profile. 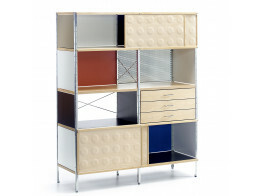 Eames Storage Unit Bookcase with moulded plywood sliding doors and height-adjustable legs. 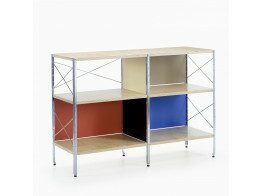 Eames Storage Unit is a made of free-standing multi-functional shelves on height adjustable legs. 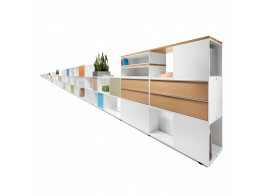 Terri Tory Office Storage is a modern office multifunctional combination storage range. 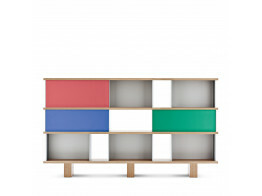 Kast by Maarten Van Severen is modular storage, the base version of which is a sideboard. 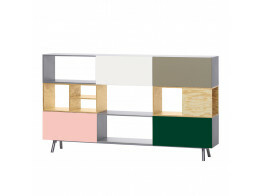 526 Nauge Storage collection offers sideboards, cupboards and bookshelves.